Zachary Leeman at LifeZette.com interviewed former Navy SEAL Jack Carr, the author of the thriller, The Terminal List and the upcoming True Believer. Jack Carr (shown above right) made a big splash in the literary world when he released "The Terminal List." With Navy SEAL Lt. Cmdr. James Reece, he introduced a hard-nosed protagonist who could stand shoulder-to-shoulder with other beloved modern western heroes in literature, such as Brad Thor’s Scot Harvath or Stephen Hunter’s Bob Lee Swagger. What made Carr’s writing so engaging and fresh, in part, is that he’s had a career as a Navy SEAL. That knowledge helped inject something new into “The Terminal List.” Because of Carr’s work with the military, he needed to go through the rigorous process of having his book approved by the Department of Defense (DOD), which had to ensure Carr was not divulging any government secrets he’s been sworn to keep. The process went smoothly enough and “The Terminal List” made it to shelves everywhere. The same cannot yet be said for his second book, however. 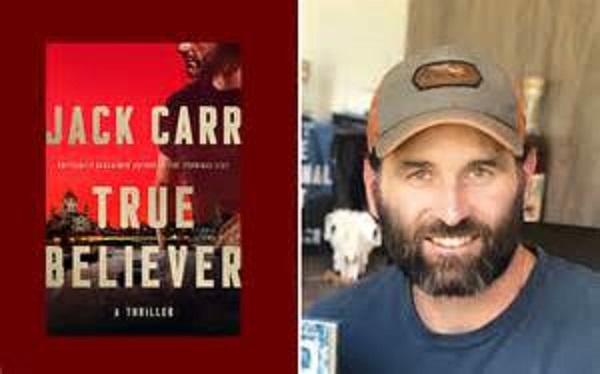 Carr’s much-anticipated follow-up novel — “True Believer” — has had its release date delayed due to the review by the DOD. Originally set to be published April 2, “True Believer” will now have a publish date of July 30. Carr’s publisher released a statement about the delay through Twitter. Carr’s first book was “cleared as amended” by the Department of Defense Office of Prepublication and Security Review; and Carr left those redactions in the text of his book. He was planning on doing the same thing with his new book, but the Department of Defense has pushed the deadline several times. Question: Is there any chance the Department of Defense review could cancel the publication of this novel? Do you have a timeline for when the review will be done? Answer: First, I need to say that, in the grand scheme, I realize these are exceptionally good problems to have. I feel extremely fortunate to be doing something I love so much each and every day. Now, I doubt they could cancel the publication of “True Believer.” It is 100 percent a work of fiction set against a current geo-political backdrop. They may redact or “over”-redact, but I can’t see how a work of fiction could possibly warrant this much scrutiny, much less cancelation, by the government.